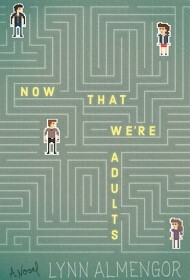 Lynn Almengor’s engaging debut novel, Now That We’re Adults, is the story of a group of 20-somethings doing their best to navigate career, family and romantic relationships in small-town Pennsylvania. Light-hearted Wade has just been dumped by his girlfriend, the one he thought he would marry, while his brother Ian is beginning his marriage and starting a family. The breakup is something of a wake-up call for Wade: Maybe Jill was right when she accused him of lacking ambition. Ian, the more serious brother, is dealing with his own issues that come with struggles in his career and a newly pregnant wife who is less than thrilled with her future as a mother. Their parents, Ian’s wife, and friends they have known for the majority of their lives, all play important roles in the story. Each searches for answers to some of life’s most difficult questions, and they find them in surprising places. Poignant, quirky, cleverly humorous and infinitely relatable, Now That We’re Adults could easily be a big-screen ”dramedy” appreciated by the generation it portrays and still thoroughly enjoyed by others. Through the collective experience of a well-realized cast of characters, the author explores marriage, friendship, romance, family dynamics and parenthood, all during the difficult and uncertain point in life that is post-college but not quite settled. With witty and genuine dialogue, the story manages to be simple yet surprising, employing multiple perspectives. The author blends her characters’ individually unique voices flawlessly. Now That We’re Adults is a skillfully layered reading experience, one that will be thoroughly enjoyed by 20-somethings—and even those well beyond the millennial generation.